The “Write to Change the World” program has hosted three one-day workshops with Op-Ed Project facilitators at UCLA, UC Davis and UC Merced. When UC San Francisco Professor Elizabeth Dzeng wrote about homelessness for the San Francisco Chronicle, she wasn’t just conveying her expertise on a critical social issue — she was working as part of a cohort of roughly 60 faculty members across nine UC campuses who are all committed to increasing public engagement. Dzeng’s op-ed, which focused on a patient whose chronic illness was heightened by a lack of safe, stable housing options, was one of the first pieces to come from the “Write to Change the World” fellowship program, which launched last year and is led by the UC Merced Center for the Humanities. 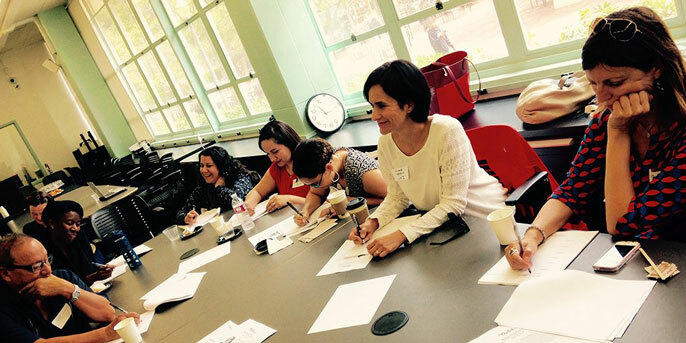 Faculty from across the UC system at the Op-Ed Project workshop at UCLA. The program works in partnership with the Op-Ed Project, a national initiative devoted to increasing the diversity of voices, variety of perspectives and quality of ideas in the media. The “Write to Change the World” program has hosted three one-day workshops with Op-Ed Project facilitators at UCLA, UC Davis and UC Merced. Roughly 20 UC faculty members attended each of the workshops, which explored topics such as how to write for the mainstream media, how to pitch ideas, and how to condense an area of expertise into a concise and meaningful description. Professors who took part were encouraged to draft an op-ed within three months of the workshop and were connected to Op-Ed Project mentors. Several fellows have already published articles. Dzeng said that while she has written other op-eds, there often is little incentive or encouragement for faculty members to pursue that avenue. Time always is an issue, and some don’t see value in writing blogs or opinion pieces because those can siphon away time from manuscripts. Participants of an Op-Ed Project workshop. UC Merced anthropology Professor Robin DeLugan, who attended the Merced workshop in April, recently placed an article with the North American Congress on Latin America (NACLA) on the repeal of the war-related amnesty law in El Salvador. In the UC Merced workshop, organizers talked about the importance of being timely and connecting current events to an area of expertise. That message resonated with DeLugan, whose piece was published on the NACLA website in July. DeLugan said she is committed to community engagement and connecting research to the world — and in cultivating a larger audience for her work. UC Merced is a natural home base for the program, given the campus’s focus on community engagement and diversity, and it is working collaboratively with nine other humanities centers in the UC Humanities Network. In its first year, the “Write to Change the World” project was funded in part through a Multi-Campus Research Programs and Initiatives grant awarded to the UC Humanities Research Institute by the UC Office of the President. The Center for the Humanities is pursuing a second round of funding to continue and expand the program, according to Director Ignacio López-Calvo, with the goal of creating an annual program that would be a primary focus of the center’s efforts. Like Dzeng, UC Merced sociologist Tanya Golash-Boza has published many op-eds over the years, primarily focusing on her research into topics like immigration and deportation. And like Dzeng, she still found great value in the workshops, which she said help faculty members develop an understanding of themselves as experts and provide valuable connections to mentors along with insight into the media. Golash-Boza said she appreciates the opportunity to present her research to a broad audience, and that an increased variety of voices in the media creates a more accurate picture for the public. “The broader the range of views, the better the understanding of the world,” she said.